Your exit rule is still -25% DD right? It can seem thas I am speaking against my interest but if you think better it isn't so. We don't make money on AUM but on the GROWTH of the AUM , so if investors have a good entry traders make more money. Traders need educated investors. My exit rule is 20% loss on my investment, not absolute DD . At the end of the day PERFORMANCE is what atract money uh? DScore is understood mainly by other traders, many investors look to return and lenght of trackrecord. I think 50% is an important psychological level for investors. Congratulations! Keep on doing this nice job! It is a long term game. KVL is an algo portfolio without any manual interference. Pure techincals revised every 3-6 months . I think I speak for many when I say there is a lot to be learnt from your perseverance when it comes to KVL. It has been a long process of porfolio optimization, now KVL is running on 6 markets but I dont want to remove nothing more, it would reduce the robustness of the portfolio. As @VolcanoFX said once, it is an eternal fight beween stagnation and overfitting, between perfomance and robustness. I couldn't agree more .. 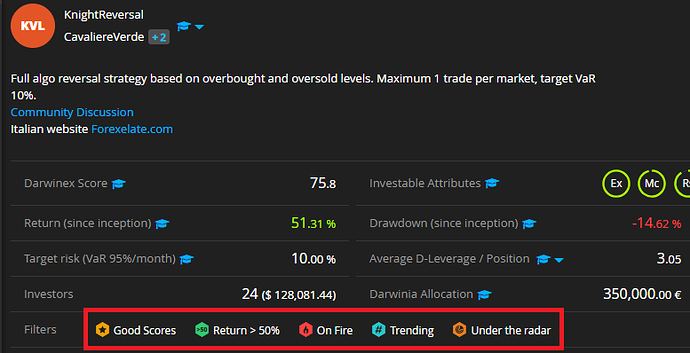 Impressive Q3 , also two months in a row into Darwinia's TOP 5! You are right there are no open positions now. Ciao CavaliereVerde and congratulations on your results. Time must pass thought and if something is destined to go in one direction, it will go there. Last month you had a +30% more investors, I wish it's a right sign that people are starting to approach the concept of solidity. All the best for you and your KVL. +100% Investors since that message, also +10% of Return, all deserved!